Community members met in small groups to discuss issues with Unionville-Chadds Ford administrators. The audience got some sobering news at a Nov. 11 “Community Conversation” held at Unionville High School. 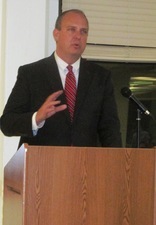 Charles Gaza of the Chester County District Attorney's Office spoke on Nov. 11 about student safety concerns. He pointed out the reconfigured entrances at the district's schools, the sign-in process in which every visitor must wear an ID badge, and the unseen changes – such as the safety film put over all outside glass doors to prevent an intruder from shooting the door and walking in. During the presentation, a video was played that showed an armed intruder shooting a reinforced door. The glass shattered but stayed intact. The intruder fired several times and spent a minute and a half kicking the glass before finally gaining entrance. Gaza spoke about how the District Attorney's Office has worked with all 57 police departments in the county to train them on what to do in a mass shooting incident. “That's about 800 officers, who have to have one platform of training so they know how to react if an incident occurs anywhere in the county,” he said. The crisis situations are now called an “active threat,” Gaza said, since not all could involve guns. The “Mass Casualty Response Plan” includes any place where large numbers of people could be victims – movie theaters, offices, businesses or schools. Gaza said that the chaos of reuniting hundreds of people after an incident, of securing the scene and processing each part of it could take up to 72 hours. “And it can take a month to begin to get answers,” he said. An immediate concern to families nationwide is the heroin epidemic. “It is one of the greatest threats to our children,” Gaza said. Over-prescription of painkillers means many of the pills go unused, and are forgotten in medicine cabinets. Children and teens know where to find them, and since the pills are prescription medicine, they assume they are safe to experiment with. “There's a good chance you will be your child's first drug dealer,” Gaza said. Drug cartels based in Mexico are sending heroin north, accompanied by pure crystal meth, “and they do that to create a new demand through the Philadelphia hub,” Gaza said. The third large issue facing schools and the community is internet communications. Because teens typically know more about technology than their parents do, it's easy for an illicit photo of an underage person to be sent from student to student, and for students to hide their activity online. Gaza credited Unionville-Chadds Ford School District administrators and staff with being extraordinarily cooperative and open about incidents in the district. The parent meant no harm and the issue was fully investigated, but Sanville said it brought up issues of what constitutes a threat on school grounds. In a later incident in the high school parking lot, a routine inspection of the lot by a team with a dog that is trained to detect explosives and drugs indicated that a student's car was positive for gunpowder. The subsequent investigation revealed that the student had been hunting over the weekend, accounting for the trace element of gunpowder, but he admitted that he had a knife in the car. How might we encourage students and parents to come forward to report possible issues? At a neighbor's home, a student's parents are out of town. You notice students arriving for what appears to be a party. What do you do? How do we keep our kids safe in the new cyber world? What are the greatest safety issues confronting our students? What should parents/students/UCFSD/community members do to improve student safety? Where do you believe the district should focus in the next phase of improving student safety? As the meeting drew to a close, community members tallied up which issues they felt most strongly about, and the administration will study the results and issue a report.